This weekend is the Drum Corps International World Championships. Nine years ago I had the pleasure of performing in this event, and ever since I’ve joined with other DCI alumni in changing my Facebook profile picture to a picture of me when I was still in drum corps. Since blogging is my preferred platform, I want to make sure I share it here too. The sad part is I never actually stored this image anywhere but Facebook. 2006 Alex was a foolish Alex indeed. Somewhere along the lines it got stored in Facebook as the profile picture size instead of the full size image so I only have this tiny one. Oh well. If you’ve ever marched in drum corps please make sure to share those pictures to help grab attention to this growing and amazing activity. And save a copy somewhere other than Facebook. 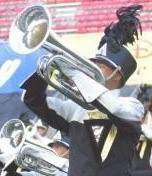 Myself, when I marched Euphonium for the Glassmen Drum and Bugle Corps in 2006.